Religion was of central importance in the Aztec society and a variety of rituals and festivals were associated with Aztec religion. One of the most important aspects of not only religious but social festivals of Aztec society was the abundant use of masks. Use of masks for religious and cultural purposes existed in the Mesoamerican cultures for centuries and thus the Aztec tradition was carried over from the previous traditions. Aztec masks were created in a number of ways and had a variety of different purposes. Sometimes, masks were even created just for display without being used. The Use of masks for religious and cultural reasons was widespread in the Aztec society before the arrival of the Spaniards. However, the history of these masks can be traced back to earlier Mesoamerican cultures and the Aztecs only took over this practice from previous cultures and began to use masks in various ways. The Aztecs not only made masks for wearing, they also made them just for display. This includes masks with no eye-holes which were made to just place on stones or skulls. Aztec Greenstone Mask, Aztec masks came in a variety of types and styles since masks were used for different purposes. Since religion was of primary importance in Aztec society, the Aztec masks were important to the people too. Due to this reason, the use of masks was not restricted to a specific area but was prevalent throughout the Aztec Empire. 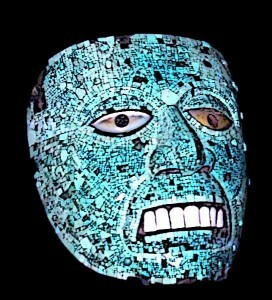 This is evident from the fact that Oaxaca sent a tribute of ten turquoise masks to the Aztec capital every year. Various religious rituals and even funerals were accompanied by the Aztec masks. Since the Aztec month consisted of 20 days and this translated to 18 months every year, festivities at the end of every month meant a lot of people used Aztec masks. Aztec masks came in a variety of types and styles since masks were used for different purposes. Some of them were used for religious rituals, some were put on dead people, and some were used merely for display. The masks used during the religious rituals often represented one god or another since there were many gods and specific rituals were reserved for different gods. For instance, the masks created for the god Quetzalcoatl would have snakes on it and similarly masks for other gods would have other designs and styles according to their specific powers. A very important type of Aztec mask was the death mask which usually had closed eyes and an open mouth. These masks were mainly used by rich people after death and were thought to be useful in the afterlife. The main purpose of Aztec masks was the appeasement of gods since these masks were an integral part of religious rituals and festivals. Other than the ordinary people, the priests also wore the masks while performing a certain ritual or while offering something to gods. Another tradition in the Aztec society was that a warrior would sometimes remove the face of his victim and present that “mast” as an offering at the temple. 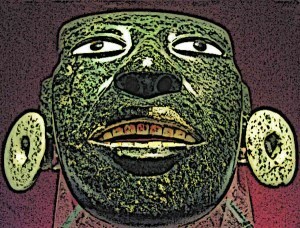 Thus the Aztec masks were important in almost every domain of Aztec life. Aztecs used a variety of materials for making their masks. The most valuable of all these materials was turquoise which was considered sacred by the Aztecs. Due to this reason, the city of Oaxaca was asked to pay turquoise masks as its tribute to the Aztec Empire. 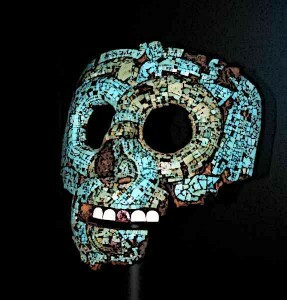 An example of this kind of masks is the turquoise mask of Tezcatlipoca at the British Museum. But other materials were also abundantly used and it was also common to cover the masks in mosaics made of various materials such as gold pyrite, carol, and shell. In the making of the mask itself, materials like wood, black and green stone, obsidian etc. were used. Some masks also had inlaid teeth and eyes to give them resemblance to an actual human face. Thus actual human skulls were also sometimes used as masks in which case they were decorated with various materials. Aztecs masks were important in rituals and ceremonies of the Aztec society. The masks were considered magical ornaments and their use was regulated which reflected the class structure of the Aztec society. Thus the masks made for the rulers were often made of the most expensive and exquisite materials. Further, the masks reserved for the politically powerful individuals of the Aztec society were denied to the common people. Precious metals and plumes were abundantly used to decorate these masks. The priests during the ceremonies wore masks resembling different gods to symbolise a specific god’s power. The masks of the rulers and the priests signified their ability to intercede directly with the gods. Mask of Quetzalcoatl British Museum – One of the most important types of Aztec masks was the death mask. One of the most important types of Aztec masks was the death mask. A peculiar feature of the Aztec death masks is that they had closed eyes and open mouths. Death masks were also often decorated with various ornaments and were generally reserved for rich people. Along with the mask, the dead person was also sometimes dressed in the clothing of a particular god. The significance of these death masks was that it was thought to establish a connection between the deceased and the gods in the afterlife. After funerals, masks would sometimes be buried with the corpse or preserved by the heirs of the deceased in memory of them. Aztec society was a very religious society and a wide range of gods were worshipped in various rituals and ceremonies. One of the most important parts of these rituals and ceremonies was the use of Aztec masks which were used by priests as well as the common Aztec people. Different kinds of masks were used for different gods to signify their unique powers. Additionally, Aztec masks were also used for the dead people since it was thought that these masks would result in the favours of gods in the afterlife. Masks made for the rich people were often elaborately decorated with precious materials while the masks of the common people were relatively simple in comparison.